My son finally decided he’d rather build Batstuff than a spaceship with which to battle my Guppy, so he decided I could break it up for parts after all. What this means is that I was able to finish out my spacewhale; officially the Cetus-class Dreadnought. 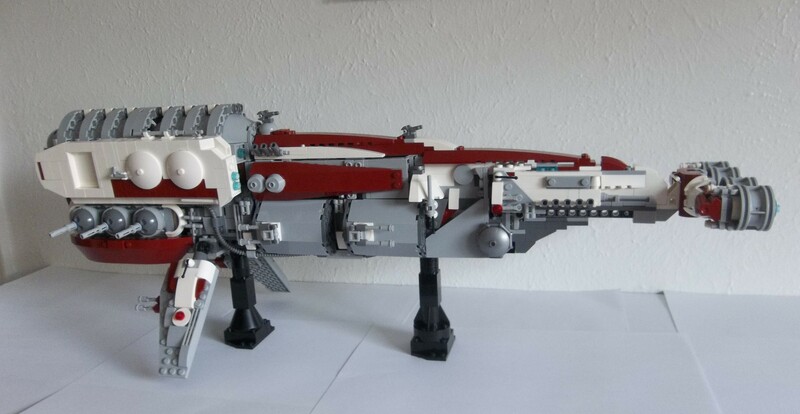 If you’re building a spacewhale, it should result in a good-sized build unless you’re being deliberately ironic, and Cetus‘ 24-inch length is respectable, if not the 37 1/2 inches of true SHIP territory. I’m coming to the conclusion that I can technically build to a 100-stud length, but I need more bricks if I’m going to do it well. Something between 24 and 30 inches is more reasonable for my current brick inventory. The Cetus actually looks like it ought to measure more than a mere two feet, but that’s what my tape measure says. Perhaps it’s the modified-teardrop shape giving it the illusion of foreshortening. The sperm whale has the closest body form of real-life cetaceans to that classic “antique whale” look, and it’s a predator to boot, so that’s the model I’ve used for the dreadnought. While it would be fascinating to see a space dreadnought modeled on a Humpback or Bowhead whale, I think I made the right call going with the largest of the toothed whales. 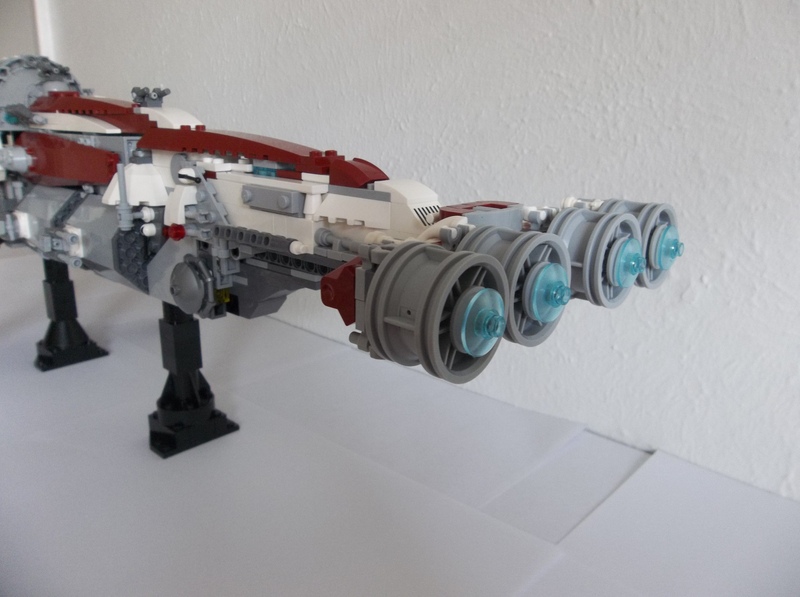 White and dark red have been successfully used as a colour scheme by the Old Republic and the Rebel Alliance for generations now, and they are one of my “doable” large-ship liveries based on household brick availability. I went with it, and though it’s less oceanic than some things I might have done, it still looks pretty good on a whale. Especially with the generally more uniform light grey structural parts. I think this is one of my most satisfying creations for some time. The ribbed half-cylinder top of the front hull, the greebling, the overall form… The tail’s probably the least pleasing part, and even that’s workable. Not a stroke of brilliance, but workable. Technic wheels like this are about the simplest and most uncreative ways of doing large engines, but at least I have some in grey now; I’m not restricted to Ninjago gold. The vessel has a decent spread of guns, from the cup-and-ball sponson main guns through the side-mounted turrets and forward-firing fin guns to the upper broadsides, small dorsal turrels and control lever turrets. 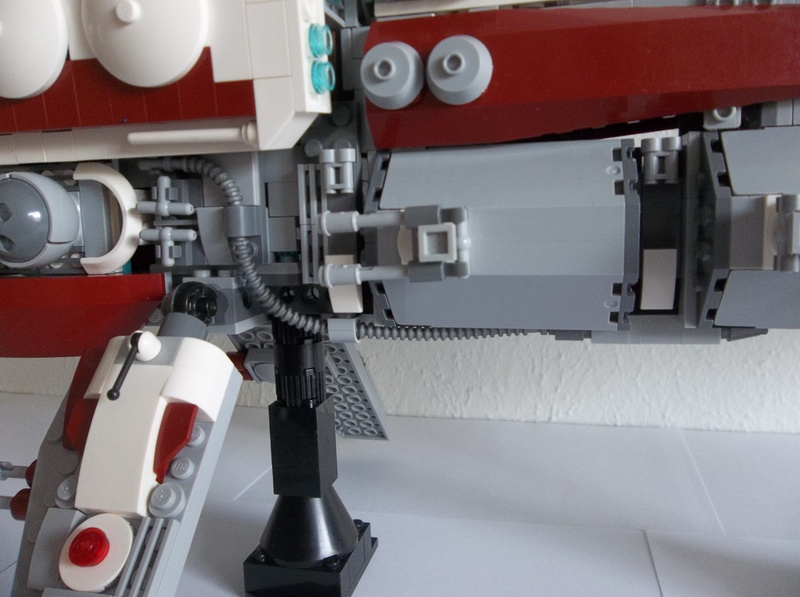 I’m not even certain whether the control levers are point defence turrets or some sort of antenna mounting, but they could go either way. That’s one thing this doesn’t have a lot of, actually: visible antennas and sensors. I’m assuming the forward dome hides some sort of sensor array, but apart from that there are only a couple of antennas further back. 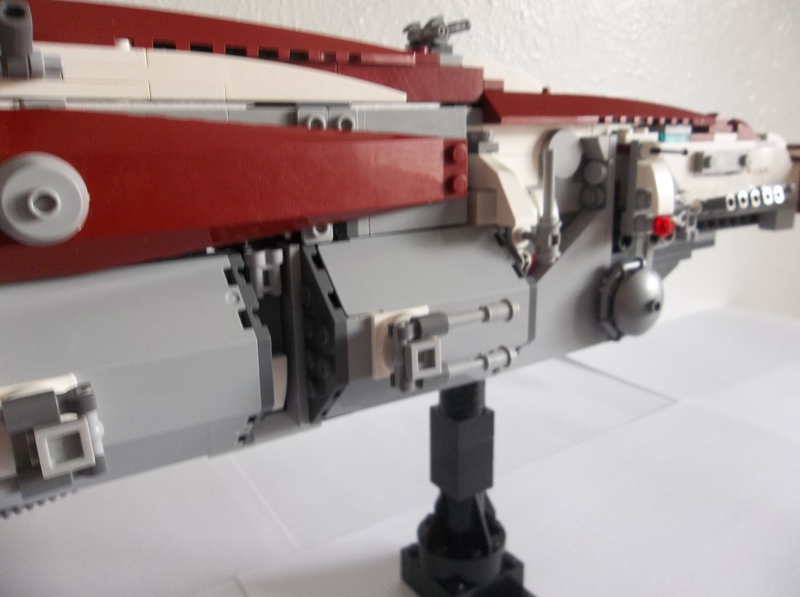 And any attempt to place antenna bricks on the bow section, for example, would just make it look too whiskery and lose the impact of the whale shape. Ah, well, who says sensor arrays in the 24th Century (or whenever) can’t be hull-conforming? There’s also a drop-down ramp for whatever fighter complement it carries, looking rather like the sperm whale’s mouth. I finished my first multi-day build, and appropriately enough, it’s a whale. Or at least, a Cetus. 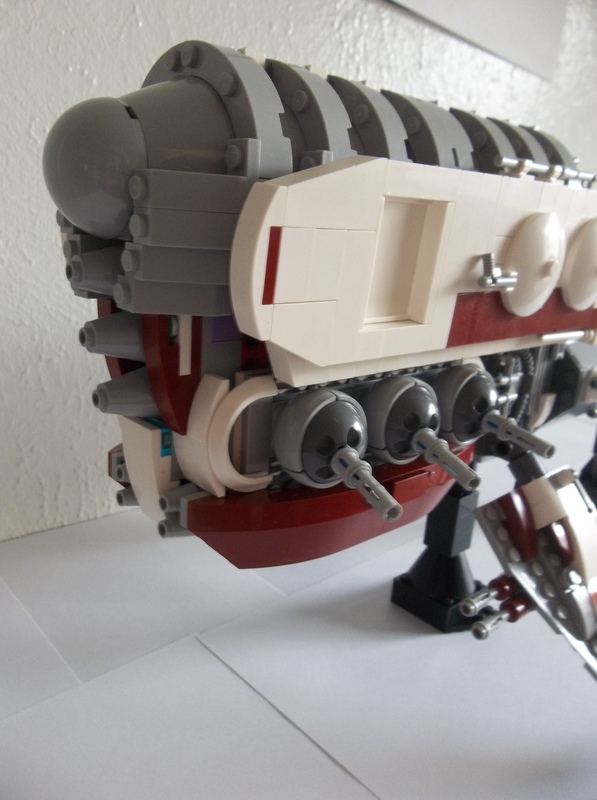 This entry was posted in Lego Space and tagged Lego, Microscale, MOC, Space Cruiser, Spaceship on August 31, 2017 by geoffhorswood. Wow, this is superb! Absolutely superb! The ribbed head, the greebling, the overally whalelike shape… You’ve done a terrific job with this, man. Really terrific job. 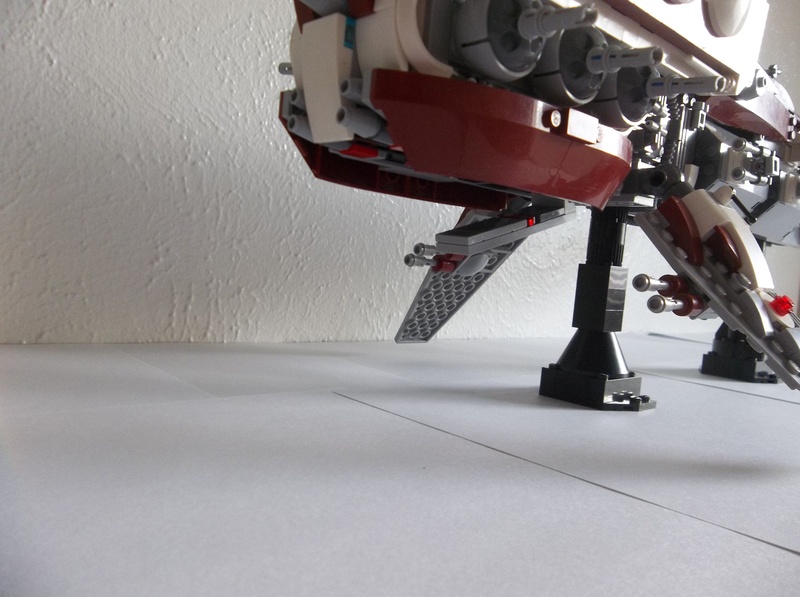 It’s hard to make things flow well at this scale, but you’ve really nailed it with this craft. Fantastic work! Thanks, my friend. Having parts of this in my head may be why I was disappointed with the Blue Guppy. Best. Lego. Whale. Ever. It reminds me of that star wars ship with the rammer! I love seeing your builds. There absalutely superb! Thank you so much! I was really pleased with how this turned out; I’m so glad you liked it!